Food delivery has been around for longer than anyone can actually tell—the first record of ordering food and having it delivered is lost in the meanders of time. Presumably, some of the more developed ancient civilizations, such as those in India, Egypt, Greece, Rome, or Persia, did, at some point, discover the benefits of asking someone to bring you (warm) victuals. We’re just probably never going to find out where and when. 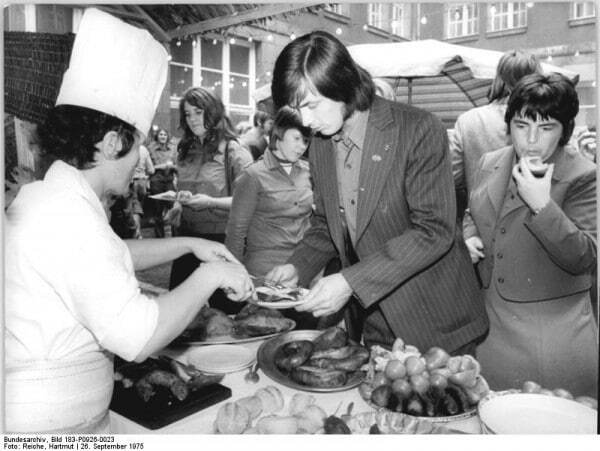 A currywurst street vendor, in Berlin’s Bauernmarkt, in 1975. The history of food delivery is intrinsically linked with those of street food, fast food, and takeout. Meanwhile, nowadays, food ordering seems to be a run of the mill thing—something we do without too much thought. It’s available everywhere, from San Francisco CA to Ann Arbor MI. In most major cities, like Brooklyn NYC, Atlanta GA, Denver, Houston TX and Dallas, Texas, or Las Vegas NV, it’s available 24 / 7. Craving Thai or Korean late at night? No problem! There’s bound to be a restaurant nearby that will cater to your exotic tastes at any hour. Will nothing satisfy you like an organic meal? Chances are that some of the snazziest places downtown will be willing to appease your palate with fresh, healthy food. But how has all this come about? The food delivery revolution has arrived hot on the heels of the trade globalization, web 3.0 and e-commerce revolution movements. It is, in many ways, a close cousin of takeout, as well as a sister of food ordering via phone. For all the above reasons, and several others that remain unlisted, today we’re exploring everything there is to know about food delivery. The post will tell you a bit about the history of food delivery, the current state of the industry in the US, in hard facts and figures, and also provide a cursory glance at some of the major players in this market segment. But first, we’re going to start you off with a definition of food delivery. Food delivery, either via online apps, webpages, or telephone, refers to the process of having food brought to your home, after ordering it from a food co-op or restaurant. In many cases, ordering food online requires the client to sign up for the service by creating an account. This often means that they agree to getting emails about discounts, special promotions, and company news, and it also streamlines the ordering process, for return clients. 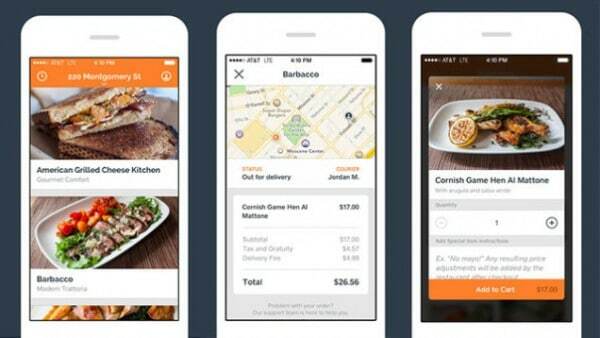 Mock-up of food delivery app, designed by Justin Graham. the food ordering company website or app. Search for a favorite restaurant, by filtering the ones available. You can typically base your search on location, pricing point, and/or type of cuisine (i.e., Mexican, Indian, Chinese, etc.). Select the available items and create your order. Enter your address, contact telephone number, and/or email and/or instant messenger handle. Opt for a payment method. You can pay in cash upon delivery, or by card. Provide your payment details (card number, security code, name, and expiration date), if you opt for online payment. Opt for a delivery method. Some restaurants in some parts of the world will let you choose between home/office delivery and pick-up. Ordering food, online or through the telephone, is a simple process, designed to slash the time it takes between feeling hungry and paying to put something delicious on your plate. It really doesn’t matter if you’re in Austin, Phoenix AZ, Portland, Oregon, Seattle, the District of Columbia, Orlando, Springfield, Miami FL or Tampa. Of course, the major sites and apps are certainly setting the standards for this market segment, but they’re definitely not the only ways in which you can use the Internet to call in for food. Pizza Hut, McDonald’s, Burger King, Olive Garden, Chipotle, Subway, Taco Bell—and the list is virtually endless. What all these names have in common is that they’re restaurant franchises; most of them have gone global and currently count thousands of locations, both in the United States, as well as in several other markets around the world, throughout North and South America, Europe, Asia, and Australia. Since they’re essentially restaurant chains, it goes without saying that they have a strong informational and transport infrastructure in place. They’re present just about anywhere, from DC to San Jose, from Newport Beach to Fargo, from Columbus, Ohio, to Philadelphia, and Arlington VA. When online commerce exploded onto the scene of consumer goods retail, it would only follow logically that they would make use of the pre-existent structures. What followed was that many of these chains teamed up with online commerce companies, in order to streamline and foul-proof their ordering process. Many of them have reported great success as a result of these endeavors. According to Papa John’s representatives, in 2008, the company’s online sales were increasing at a pace of 50% per year, while the total tally of such sales came up to nearly $400 million in 2007 only. And the operational director of The Original Pizza Pan, Inc., Annie Maver, has said that online ordering has helped increase sales with non-English speaking customers. As for the franchises that don’t do deliveries, some of them are using online ordering systems nonetheless. Why? Because it helps them solve the issue of accurate, quick reservations, as well as that of pickup deliveries. Managed systems. Database and account management solutions for restaurants. Some restaurants want to oversee the ordering and delivery process in-house, so food delivery companies develop and sell such SaaS solutions to them. Unmanaged systems. Internet-based app-as-service-solutions. This is the type of service that customers are better acquainted with. When they sign up for such a service, restaurants have to pay a percentage of their earnings to the food delivery company. In turn, as per their contract, the company will deliver food from several restaurants in the local area, or at national level. The main difference between the two types of services, on the customer’s end, is how they create and update the menu. For managed services, this is done either via phone or via email, while for unmanaged services, the customer has to create their own menu. On some sites that offer unmanaged services, the menu is created with the help of a wizard. In the age of smartphones and mobile Internet connections, many restaurants will also offer their clients the alternative of ordering via mobile, with the aid of an app. App-based orders sometimes benefit from discounts. 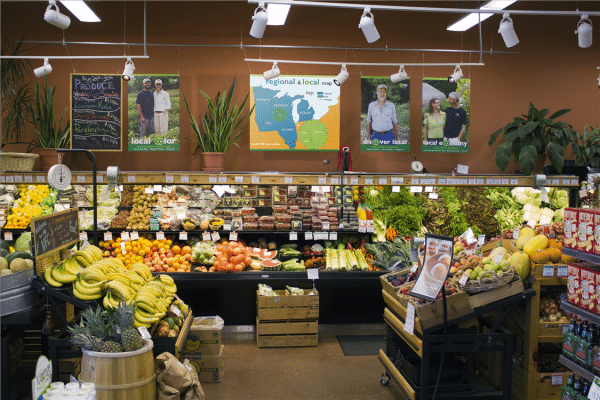 Based on where you live and on the availability of seasonal whole foods in your area, you may or may not be familiar with food co-ops. These cooperatives deliver locally grown food to central pickup stations. Customers order them based on the stocks during that particular order cycle. When the time comes to pick them up, they are notified that the order has arrived at the station. According to data from the National Co-Operative Business Association (NCBA), there are some 30,000 functioning co-ops in the United States and they account for over 2 million jobs. Though most experts will agree that take-out has been around, under various guises, since ancient times, the modern history of delivery services in the U.S. has been influenced in equal parts by social and technological evolution. Food delivery was born at an expected intersection down the line, between the evolution of street food, fast food, catering services, and communication technologies. To bring you a clearer picture, here’s a timeline with a few important moments in the evolution of the food ordering industry. Street food is a common element in many ancient cultures. In medieval times and the Renaissance, street vendors were very popular. Their existence has been historically attested in Paris, London, 10th and 11th century China, as well as Aztec markets and Renaissance Turkey. Catering services were largely an African-American affair in the 19th Facing segregation and the fact that they were not allowed in regular restaurants saw African-Americans prepare specialty foods for the homes of affluent community families. Historic records also speak of early women caterers in the 19th century. By the mid-1930s and 40s, this typically African-American industry had been taken over by more recent migrants: Greeks, Italians, Chinese, etc. Chinese take-out boxes had been invented in 1908, for oyster pails. By the 1970s, the popular Asian takeout accessory was being mass produced in Hazelton PA by the Fold-Pak Corporation, specifically for takeaway meals. Chinese and Italian take-out had been available since inter-war times in the US. 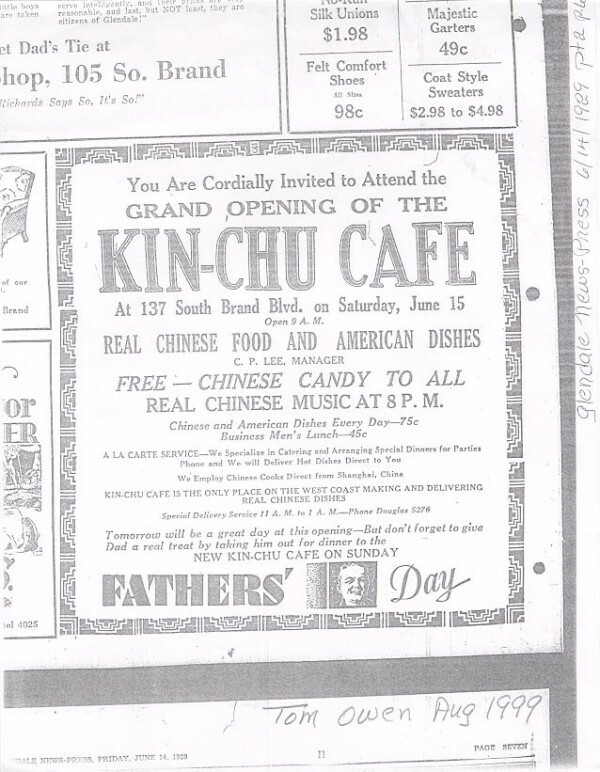 The first print mention of Chinese food delivery dates back to Los Angeles’ Kin-Chu Café, circa 1920. In 1944, The New York Times was writing about Luigino’s Pizzeria Alla Napoletana, which “prepares authentic pizza, which may be ordered to take home. They are packed, piping hot, in special boxes for that purpose.” The pizzeria was located at 147 West Forty-Eighth Street in New York. Take-out rose to fame in the 1950s. This was mostly due to the return of WWII GIs to their State-side homes. They brought along a boom in popularity for family restaurants and also helped ‘ethnic’ cuisines enter the mainstream. Also, it was the time when television first became available to the masses. Automobiles, which made take-out all the more accessible, and helped bring about the invention of the drive-thru started being mass produced at full speed once more. Food trucks became socially acceptable in the 1970s. Worried that these pop-up restaurants of sorts would drive them out of business, owing to their convenient locations, mobility, and lower prices restaurant owners fought against them for a long time. They were first approved by local authorities in Southern California during the 1970s and are based on similar military operations. From SoCal, they quickly expanded to other parts of the US, like Colorado, Omaha, Maine, and so on. The trucks’ initial purpose was to deliver warm meals and hot beverages to factory and construction site workers. For those who have wondered how online food delivery companies make money, the mechanism is rather straightforward. In most cases, the company will make a percentage from the total of orders cashed-in by a specific restaurant. At present, this is earning online food delivery companies some $9 billion (according to a May 2015 report by reputed website TechCrunch). That may seem like a lot, but, in fact, it only represents 13% of the US’s $70 billion food takeout and delivery market; it goes without saying that, in spite of the rise in popularity witnessed by online food delivery, takeout still reigns supreme over this market segment. 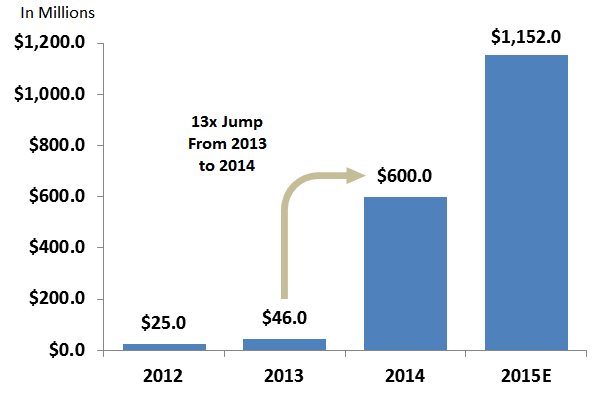 That being said, the influx of capital into online food delivery has been all but massive, over the past few years. Not only that, it has also been growing at an incredible pace. Consider the following sums: in 2012, food delivery companies saw $25 million worth of investments; in 2013, that figure increased to $46 million. It truly boomed in 2014, with a staggering $600 million investment into this market segment. By May 2015, this year’s figure had reached $360 million. Annualizing these sums, you come up with a grand total of some $1.2 billion. The above chart, with its 13x jump from 2013 to 2014 might paint the inaccurate picture of an over-saturated market. Potential entrepreneurs and would-be franchisees might be tempted to believe that there’s effectively no room left in this market segment for their business. They would be wrong. Take another look, at the previous image. 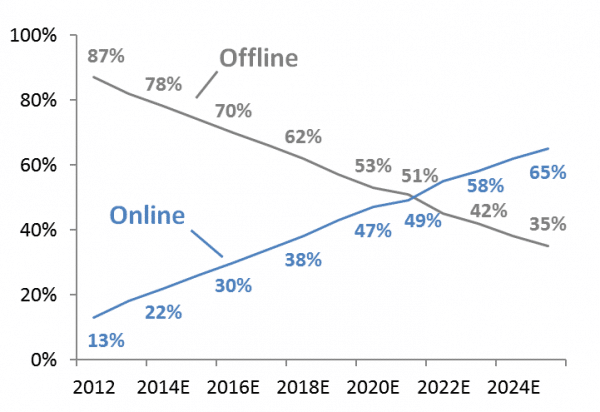 The figure clearly shows that there’s plenty of market share left, in the offline segment of the food delivery and takeout industry, which can be turned over to online enterprises. 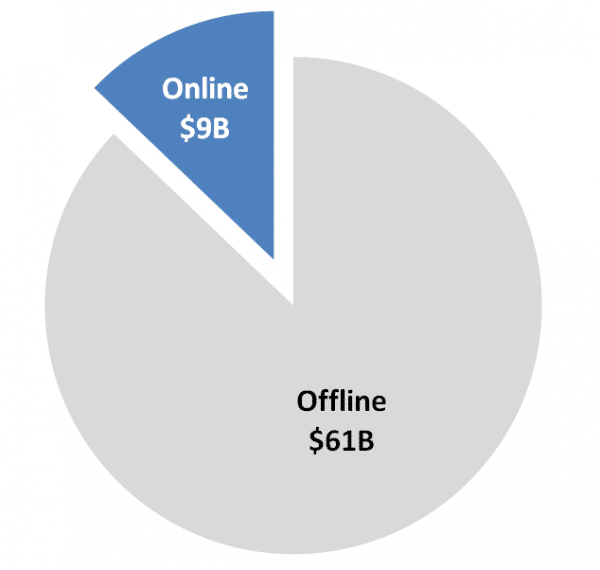 At the moment, online food delivery only accounts for 13% ($9 billion of $70 billion) of the market. In other words, in the online mobile dominated landscape of the day, only 1 out of 10 people are using their smartphones or tablets to order food. At a more granular level, the market shows even clearer signs of room for development. A February 2013 Morgan Stanley/AlphaWise survey of GrubHub clients revealed that only 55% of New Yorkers know of all their services, and/or are aware of Seamless. Bear in mind both that GrubHub is the largest online food delivery company in the US, as well as that this percentage increases to 80% outside New York. In places like Milwaukee, Tucson, Nashville, Charlotte, or New Orleans, it might as well be unheard of. Also, bear in mind that GrubHub has been around since 2004. Meanwhile, major restaurant chains like Domino’s and Jimmy John’s boast online penetration rates of 45 to 50%. Of course, they’re not selling just to NYC clients—diners in Oakland, Salt Lake City, and Tulsa are very much aware of them. Similarly, the UK’s JustEat owns a 25% market share. In South Korea, Baedal Minjok has penetrated the market by a whopping 75%. The US is trailing behind at the moment, with its puny 13%. The chart below is a rather clear indicative of the direction in which the market is headed. However, if things keep evolving at their current pace, it might take another decade before online food orders overtake offline orders. Feeling hungry tonight? You’ve got several options: run a Google query for ‘open restaurants near me’, or install an app that will deliver the food right to your doorstep. All the trouble you’ll have to go through will involve a couple of clicks and taps, plus registering for an account with your personal details. It doesn’t even matter if you’re vegan or following a paleo diet, craving frozen goods, or forgot to buy dog food (yes, pet food delivery services are an actual thing nowadays). All you need is an Internet connection to satisfy your particular tastes, be they for something quick and cheap, a gourmet dinner, raw vegan frozen desserts, or whatever else you’re into. The best part about all this? Where you live is entirely immaterial. Uptown or downtown, in Sacramento or the Bay Area, Colorado Springs or Baltimore, Richmond, Lexington or Indianapolis—there’s a good app for wherever you’re located, and for whatever dinner plans you had in mind. 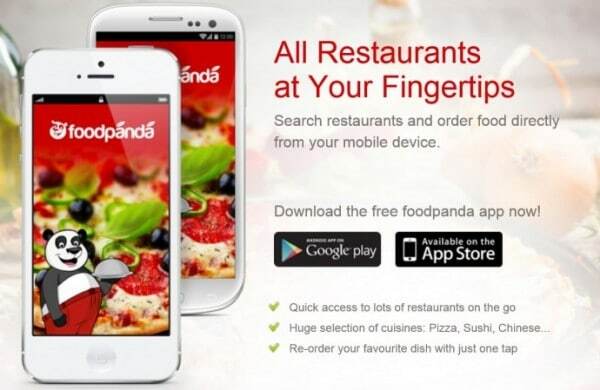 Food Panda defines itself as a ‘global mobile food delivery marketplace’. It’s available to customers both online and via a well-known mobile app. On some markets, it’s also known under the name of hellofood. The way it works is this: you go online, enter your zipcode/postcode, and then start browsing the list of restaurants available in your area. You create your order, which FoodPanda relays to its restaurant partners (over 58,000 globally, according to the latest data). After checkout, you receive an order confirmation text message via mobile, which also lists the estimated time until the order is delivered. Now known as one of the major players on the online food ordering scene, Grub Hub ensured its supremacy through a 2013 merger with Seamless. Today, the publicly listed company (NYSE:GRUB) owns several enterprises, among which its ‘sister’ Seamless, but also MenuPages, Allmenus, DiningIn, and Restaurants on the Run. All these companies offer similar services, but for the time being, we’ll focus on GrubHub. The online and mobile food delivery service lists local restaurants, which deliver, or offer pickup services in your area. When you order through their site or app, you can pay by card, via PayPal, or with cash. The apps for diners are available for both Android and iOS and also include a Track Your Grub feature which is essentially an order tracking and notification service in real-time. This way, you’ll know just how many hours are left until the grub gets onto your plate! The restaurant side of the business comes with a dedicated tablet that helps streamline orders (OrderHub), plus a driver-targeted app (DeliveryHub), which does the same for takeaway orders, by providing drivers with the best routes. Together, these two apps provide the data used by Track Your Grub. Locations: 95% of the continental U.S. 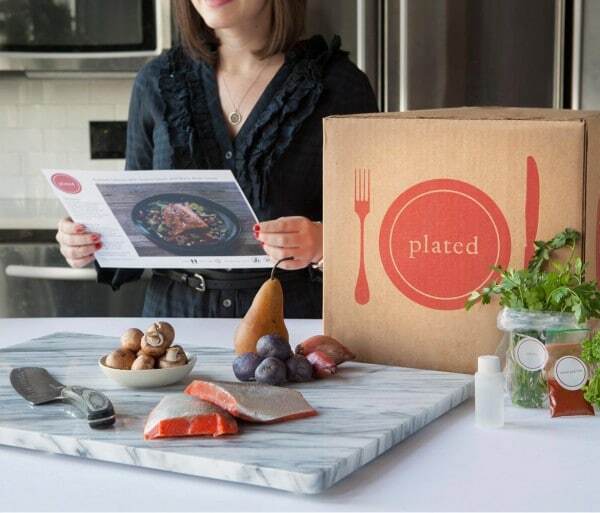 Unlike all the other food apps and sites described in this article, Plated is specialized. The platform’s mission is to help people live healthier lifestyles, by delivering chef-cooked meals and hand-picked ingredients to them. The site is also accompanied by apps, for iOS-operated mobile devices, as well as for Android. It works based on a subscription system: once you’ve paid for it, you’ll have healthful meals delivered to you on a weekly basis. The site also includes a recipe-sharing feature, complete with videos, and a recipe swapping mechanism. For clients, Seamless offers a website and a host of mobile apps (for iPads, iPhones, Android-operated mobile devices, and BlackBerrys). 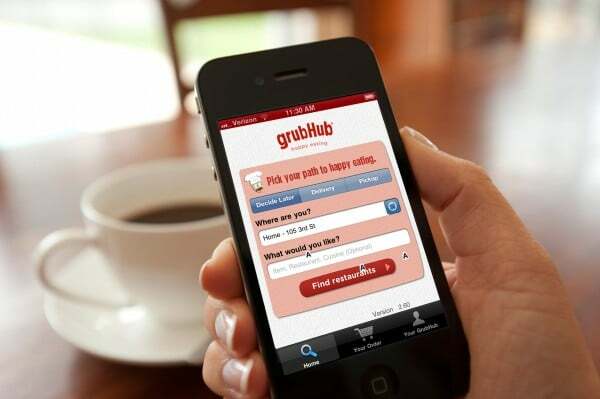 Just like with GrubHub, you can track your Seamless order via the site’s Food Tracker feature. This will update you with notifications about your order in real-time. Aside from this, Seamless also provides restaurateurs with an in-restaurant tablet (Boost), with a native system for tracking orders and order confirmations. Finally, Seamless also has a line of services specifically aimed at corporate clients, which can organize all their orders under a single account. The system allows clients to order individual meals from local restaurants without expense reports, order for groups from pre-selected lists of restaurants, and even order for catered corporate events. What sets Foodler apart from the other online food ordering apps and sites is that it generates a curated lists of up to 18 restaurants. This list is based on several factors like customer ratings, your previous orders, cuisine, and current discounts. Foodler clients benefit from exclusive deals, rebates, and specials from restaurants. 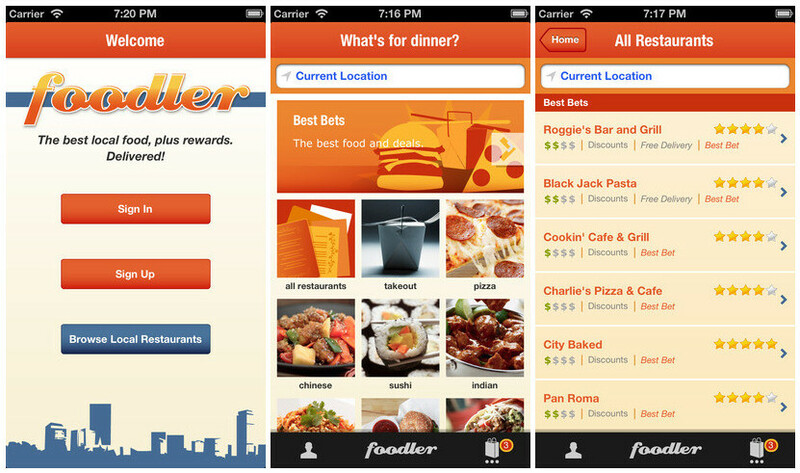 Since April 2013, Foodler has been accepting Bitcoin payments – it was actually the first service of its kind to do so. The company has released an iPhone app in April 2013, and iPad and Android apps in February 2014. They are all geolocation-enabled, which was essential for a company that delivers in all mainland USA zip codes and states, including MO, MY, NC, SC, KY, NE, ND, OK, TN, HR—and the rest of them. The apps also support live syncing with the main Foodler website. Seamless clients earn points through loyalty programs. They can then exchange those points for free FoodlerBucks, as well as other prizes, like gift cards, t-shirts, etc. One of the company’s most recently launched services is Foodler@work, which has enabled corporate pre-orders, as well as corporate event catering services. Hey Buddy!, I found this information for you: "What You Should Know about Food Delivery". Here is the website link: https://all2door.com/food-delivery/. Thank you.